How far would one go for a breakfast cravings? Well very far indeed, for me at least. This morning, after sending J off to work, I head on home, but on the way a weird craving kick in. I pictured a serene surrounding with me there having typical old times breakfast, which is toast bread with half boil egg together with a cup of chamkau (thick)! Ah, bliss. Therefore my crazed eyes start scrutinizing at every coffee shop I passed in my mini black car. The idea of going to a kopitiam (coffee shop) appeared in my mind. Nowadays, the name kopitiam no longer means the dirt cheap coffee shops by your nearby neighbourhood which you frequent everyday without fail, it now meant the posh restaurant that has all the, ironically new, old fashion furniture that recreates the atmosphere of the long gone era. They would usually come with the wooden chair, marble table, with the food counter near the entrance. If you are old enough to had that breakfast experience in an old authentic kopitiam or if you are young but remembered holding Ah Ma’s every morning to her cup of coffee, you would know what I mean. There would be the usual people in the kopitiam that you would greet, the same aroma that hits you every time you enter the shop and the furious sound of clicking abacus from the main counter. Alright, enough of dreaming, now for food scouring. As a true new generation, I decided to search for these new posh kopitiams that had been mushrooming around these few years. Must be good business, and why not, with the price of a restaurant for food of a roadside stall. We young people are getting crazier, but of course not as bad as those having a fix of coffee at those chain coffee joints. You know what I mean; those are bout 8 times the price of a regular coffee. Does ice blended cost that much more? Anyway, I remember a kopitiam at in Tesco Damansara, but when I got there, it was all pitch black. So I turn out, nearly heading home with disappointment when I thought of checking out Damansara Perdana. I did a impromptu u-turn and head there, then circling around like a hawk, cursing at the rising cost of petrol that made this endeavour so much more guilty, and then I found it. A kopitiam at The Place (a mini mall). Since it look deserted up there (I am at the bottom looking up at restaurant at first floor), I shouted at the guy sweeping the floor at the balcony. “Hello!” He kept on sweeping in oblivion. “Hi! Hello!” I waved frantically. Finally he turned and looked at me. First I had to have my fix of coffee. Nowadays, while preparing to start work next month (along with sending J off to work), I had tuned by body to wake up early in the morning. With that, I had started to act like an adult, I need a cup of coffee to kick start my day in the morning. 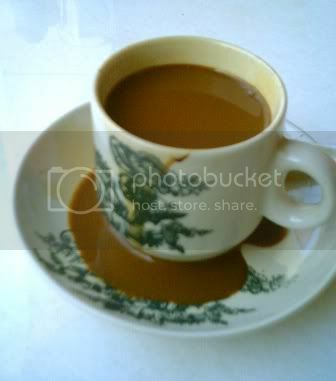 Usually, if I would go for cham, a mixture of coffee and tea with milk, my favourite. In the Hong Kong char chan teng, it is usually known as yin yong, my absolute favourite, especially the HK ones as it uses fresh milk. Anyway, since I’m here, I called its cham special, which is named Khai Sim, the name is kinda weird, but oh well, there must be a story behind it. This cham does have a special taste that I can’t quite put my finger into it, but I suspect it must be different kind of milk. Overall, its thick and quite kick off my day, but I would have prefer my yin yong. Then I called for bread toast, it says two piece, but when it comes, I came in four! How? Well, later when I was at the cashier paying, I saw an old man, articulately preparing a bread toast, which he slice it in half skillfully and attentively. Really fascinating to look at. The bread, although it’s just butter (if you open the bread to inspect), it tasted real good and sweet. By cashier I had also spied what did he put on the bread, he first use a spoon to pick up some white stuff and slowly spread all over the bread. Ah, it must be lightened (to make it watery) condensed milk. Now I know the secret. 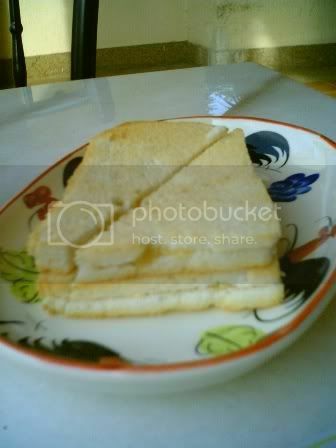 Anyway, I would have prefer my bread with kaya and butter, but this ones serves me well too. Then it was the half boil egg. It comes in 2, which at first I requested to have only 1 but the waiter says it is only this way. Oh well, let this be my only egg intake for the day then. Ha-ha. The half boiled eggs are good, just the right doneness for me, still watery enough for me to dip my bread into it, yet having lumps of egg whites and yolks. Bread soaks up all the egg goodness so well and it pairs greatly, with the best blend of sweet (the bread) and savoury (the egg). People of old times sure know how to eat eh?. My eggs are usually doused with enough pepper and soy sauce. Overall, it did fix my cravings. Though a bit costly for breakfast, I was already calculating my indulgence in my head, and wondered why I did not go to a normal restaurant instead while staring at one across the street. I wanted the newspaper to read but the waiter said the waiter who was supposed to get it has not arrived yet. Anyway, the atmosphere is good, and the old man with the tentative bread toasting at the cashier made it all worth it. Besides, to top it off, I got a surprise 20% off for the bill. The cashier mumbled the reason, which I did not quite catch but I’m a happy customer who just blithely pay her sudden more reasonable bill and leave. Now my day has started. Ha-ha. 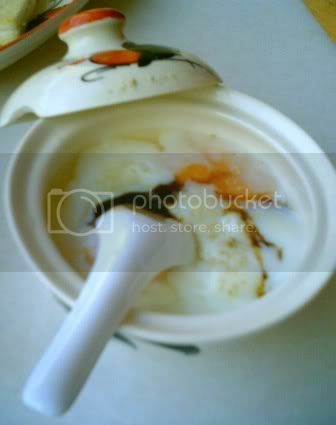 Thot d bowl contained porridge! 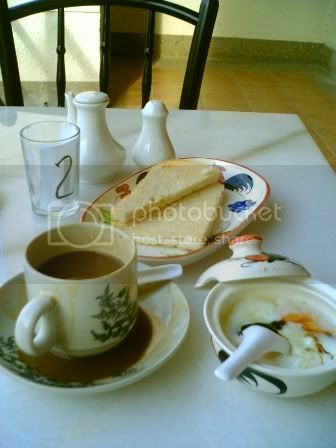 Luv d way they served d eggs. tummy and babe, it did not cross my mind as that as i know the real thing. so i tested J and he worst, said it was tau foo far!